Texan John Hagee may not have his “perfect red heifer” yet. But he does have a huge following, the ear of the White House -- and a theory that an invasion of Iran was foretold in the Book of Esther. 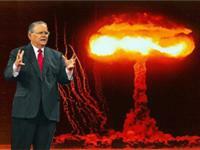 I believe this gentleman, John Hagee to be irresponsible and dangerous. With his kind of soothsaying and theology around, in the ears of the WHITE HOUSE for Pete's sake!, many people including some important world leaders are not even looking for solutions to the conflicts in the Middle East- they are instead gearing up for WW3 - lookng forward to it in fact. Their basic message is to strike Iran before it is too late. Too late for what? If this is really the supposed end of the world sequence then why are they warmongering in total opposition to the actual teachings of Jesus who instructs us to love our enemies, make every effort to keep the peace with our fellow man, never return evil for evil etc.? If this is really the fulfilling of the last days prophecies then why is it important for us to strike Iran first- what with the Armageddon ball already rolling and all? Is he trying to do God's job of fulfilling prohecy? Does he believe he has some part in the popular translation of Revelation and things just won't turn out the way they are supposed to if he doesn't get his message out? Does he see himself somewhere in the symbolism of the book of Revelation? Or is he trying to alter the outcome of these supposed prophecies with a pre-emptive strike on Iran? Does he presume to know something that the Bible tells us that not even Christ knows- when the world will end? Is he a fundamentalist crazy on par with Osama Bin Laden? Or is he just a salesman trying to hock more videos and books? Two things are for certain, this sort of fellow scares me to death....and men like this one have the potential to make the onset of WW3 a self fulfilling prophecy.